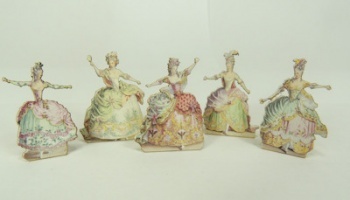 Five delightful ladies from the Marie Antoinette era. The beautiful pastel colorsand dramatic poses in this set are outstanding! Each stands 1 1/4" in height. Artwork and backing are laser cut. Just glue together and then glue wooden support to back. These are darling on shelves.